A new feature we are starting to roll out with all of our future token packs – and retroactively add to our legacy token packs – is the addition of a Fantasy Grounds module file that will give users of our tokens the ability to enable or disable a token pack within Fantasy Grounds itself. 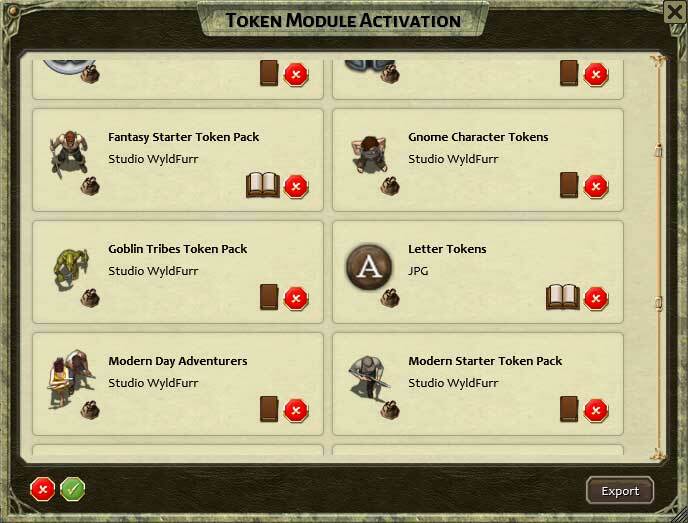 If you own one of Studio WyldFurr’s token packs, you may receive notice soon that an update has been uploaded for one or more of your token packs. This will be us updating the store files to include the Module file (Note: Only our token packs on RPGnow.com will receive an module file. Single character tokens, such as those available from our web site will not). When you purchase one of our new token packs, or if you have just had a pack updated. You will find two files available for download. The first is our standard token pack that contains the standard token image files. The other is a ZIP file that contains the Fantasy Grounds Module. If you don’t use Fantasy Grounds, you don’t need to download the Fantasy Grounds Module file, you can just use the standard token image files. Download the zip file from RPGnow.com and extract the contents of the zip into a temporary folder. Within the zip you will find a read me.txt file and the module file (the file with the .mod extension). 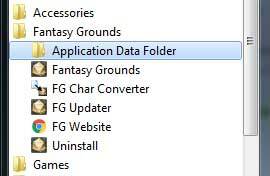 Now that you have the module file, you need to move it into the Module Folder within your Fantasy Grounds Application Data folder. You can find the Fantasy Grounds Application Data folder by opening the Program folder from the Windows Start Menu (see image to the left). 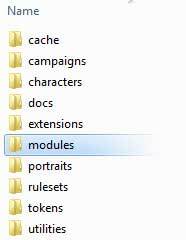 When you can see the contents of the Fantasy Grounds Application Data folder, look for a folder titled Modules. It is into this Modules folder that you need to play the .mod file. With the .mod file inside that folder, you can then access the tokens module from within Fantasy Grounds itself. To activate or deactivate your tokens inside Fantasy Grounds, first open the Token Box to view your token bags. Then click on the Modules button at the bottom of the Tokens window. From here you can activate or deactivate a module by opening or closing the book for each module. If activated, the tokens you have activated will appear in a bag inside your token box. see how our tokens can enhance your role-playing experience!